Before joining the MFA, I was a Marie Curie Researcher on EU External Action in a think tank Trans European Policy Studies Association (TEPSA) in Brussels. 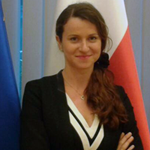 Prior to that I had the pleasure to be a trainee innter alia in the Cabinet of Š. FÜLE, Commissioner for ENP and Enlargement in the European Commission (2012), Department of Foreign Policy Strategy in the Polish MFA (2012), European Parliament (2011) and Polish Embassy in Moscow (2010). In the meantime I was a participant in numerous international projects and conferences. I am a founding member and ex-president of the Centre for International Initiatives, a Polish think tank. For my civil engagement I was granted an honourable membership of the International Relations Students’ Association of the Jagiellonian University, from where I graduated in international relations. Would you also be interested in studying at the College of Europe?